40% of a home’s heat loss occurs through the attic due to lack of proper attic insulation. AM Insulation Solutions Experts can bring your home up to today’s building code and save you money with. The older your home the less likely it is to be properly insulated. As of 2017 the new standard is an R60 rating which means 22.25 inches of insulation. 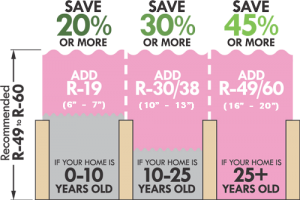 Many homes have less than 6 inches of insulation. Does Your Home Need More Insulation? Here are the tell-tale signs. 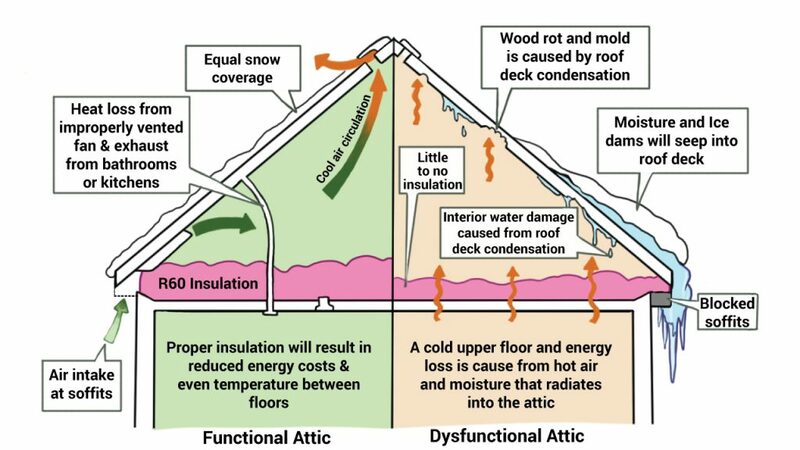 When properly insulated, the inside attic temperature is the same as the outside temperature. The ideal time to have your insulation “topped up” is when you are having your roof replaced. This allows the installers to remove a portion of the roof and blow the insulation in from outside. When this is not possible, insulation is blown in through an attic access inside the house. Our certified consultant will come to your home and check the attic for insulation and proper ventilation. During this inspection they will take photos and videos using a thermal image camera so you can see and understand the nature of the problem. You will be provided with a written quotation that outlines the work required and materials to be used. Additional vents will be added in the rafters if there is insufficient airflow. This may require adding vents to the soffits. The entire process can be completed in about 2 hours. Unlike most installers AM insulation Solutions is insured to access through the roof so it is not necessary to bring equipment into your home. 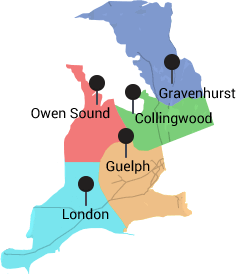 The process can be coordinated with your roof replacement and completed on the same day. The job is completed by trained AM Insulation Solutions staff – no subcontractors. AM Insulation Solutions offers an insulation ‘Top Up’ Program. Give us a call today to find out how you can save on your heating and cooling bill for years to come with properly installed insulation. Owens Corning insulation is specially designed for attics, including EcoTouch® insulation with PureFiber® Technology. It’s made with 99% natural materials and nearly twice the recycled content of other brands. With trusted insulating systems, air sealing, moisture management and sustainable building science, AM Insulation Solutions and Owens Corning makes it simple to enjoy Complete Energy Performance in your home.